تقدم كلية الإدارة والاقتصاد برامج دراسية في مجال الإدارة منذ عام 1977، حيث تتميز هذه البرامج بجودة تعليمية عالية وتعتمد على الأبحاث بالإضافة إلى تقديم العديد من الخدمات. ويتم تطوير هذه البرامج من خلال التركيز على الجودة والتطوير المستمر والحصول على استشارة مراجعين خارجيين من مختلف أنحاء العالم. يسرنا أن نرحب بكم في جامعة الإمارات العربية المتحدة وكلية الإدارة والاقتصاد ويسعدنا انضمامكم للدراسة في كليتنا. لقد قدم خبراء إدارة الاعمال الذين يعملون في المجلس الاستشاري التنفيذي لدينا توجيهات للكلية لبناء بيئة تعليمية داعمة وفعالة تتميز بمناهج دراسية تعزز من سمعة الكلية وتزيد من فرصة توظيف خريجي الكلية. كما يبحث أعضاء هيئة التدريس الخبراء لدينا مجموعة واسعة من المواضيع للحصول على معلومات واسعة لمساعدة لرجال الأعمال والمجتمع للوصول الى طرق جديدة للتفكير والتعلم. 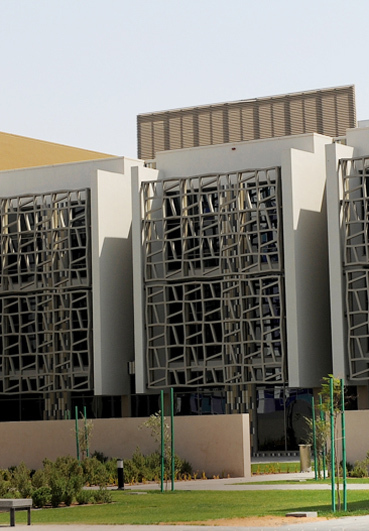 مرتبتها من بين أفضل 400 جامعة في العالم. يمضي خريجونا قدماً نحو النجاح ، ومنهم من يشغل مناصب قيادية عليا في القطاعين الحكومي،والخاص. كلية الادارة والاقتصاد هي الكلية الوحيدة في المنطقة التي لديها اعتماد AACSB في إدارة الأعمال والمحاسبة المزدوجة. لدينا فريق نخبة من الأساتذة والباحثين المتخرجين من الجامعات ذات السمعة المرموقة في جميع أنحاء العالم. نقدم مجموعة متنوعة من التخصصات المطلوبة في سوق العمل التي تزود الطلبة بالمهارات المطلوبة من قبل أرباب العمل. لدى كلية الادارة والاقتصاد شركاء أكثر من 200 منظمة خاصة وحكومية رائدة لتزويد الطلبة بالمعلومات التي تساعدهم على إثراء تجربة التدريب الوظيفي في موقع العمل من خلال برامج التدريب العملي الداخلي. بالإضافة إلى ذلك، يشارك طلبة الكليةبمجموعة فريدة من ورش العمل التي تزودهم بالمهارات اللازمة لسوق العمل. Dr Abdul Karim Khan was born and raised in Pakistan. He completed a Ph.D in Organizational Behavior at the Aix-Marseille Graduate School of Management, France. Prior to joining the United Arab Emirates University, he worked at Lahore University of Management Sciences for four years, where he headed the Ph.D in Management Program. During his stay in France, he also taught at the EMLyon Business School. Dr Khan has a keen interest in analyzing employee behavior issues in an organizational context. He is specifically interested in understanding why high performers are abused and in psychological intervention that can reduce non-supportive leadership behavior. Other areas of interest are the role of emotions in the workplace and workplace justice. His recent work on the abuse of high performers appeared in the Journal of Management, the number one peer-reviewed journal in the field of Management Studies. Since joining UAEU in January 2015, as the assistant professor of Organizational Behavior (and as an HRM in the Department of Business Administration: College of Business and Economics), Dr. Khan has published nine research papers and worked on many joint projects with colleagues from around the world. One of his papers won the award for best paper award at 2015 Academy of Management Annual Meeting. Dr Khan is a regular presenter at the Academy of Management Annual Meeting. He first presented a paper there in 2009. He has also been invited to a variety of international forums as a keynote or plenary speaker. Dr. Khan also supervises DBA students. He is currently supervising 6 DBA students who are researching topics as diverse as the socialization of new employees, organizational learning, knowledge sharing, issues of organizational justice during mergers, work engagement and creativity. Two of his students have successfully defended their theses in the last two years. Dr. Khan and his North American colleagues recently (in partnership with EMAAR) designed and tested psychological interventions that sought to reduce non-supportive managerial behavior. This study is nearly finished and promises actionable for both EMAAR and the wider academic community. Outside of the classroom, Dr. Khan enjoys travelling, reading and taking part in professional conferences and other forums. Professor Nihel Chabrak believes we should be looking at new approaches to promote growth alongside social welfare. Development should consider not only the here and now, but how generations to come will be able to shape their future lives. Professor Chabrak works in the Accounting Department of the College of Business and Economics at the United Arab Emirates University. She is researching how to promote economic connections between macro objectives, such as sustainability, and yet still create more micro incentives for the growth of businesses. In cooperation with colleagues from other well-known international research institutions, she is working on reforming finance, governance and accounting in order to support growth. Growth is about wellbeing as well as development. It is not only measured by GDP but by the dispersion, composition and sustainability of that growth. Policy makers should aim for an inclusiveness that allows people to transform their lives. 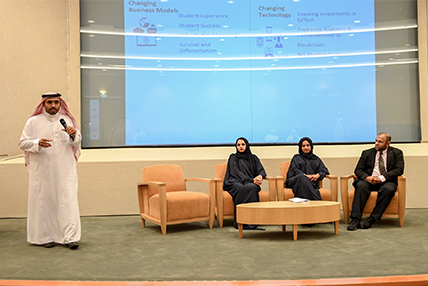 As well as conducting this research, Professor Chabrak is Program Director at the UAEU Science and Innovation Park, where she is promoting value-driven startups and encouraging businesses that are more inclusive and sustainable. Among the startups in the incubation program is Green Steps Energy. This is a UAE startup company founded by four female engineering entrepreneurs. Their vision is to establish a citizenship movement for a greener planet. They have designed an energy generating carpet (called Bezeo) that transforms kinetic energy into electrical energy. Another startup she helped with is Aroma Niche. This is an eco-friendly aromatherapy product which uses plants native to the UAE and Gulf region. This helps to preserve local heritage while offering a unique product. 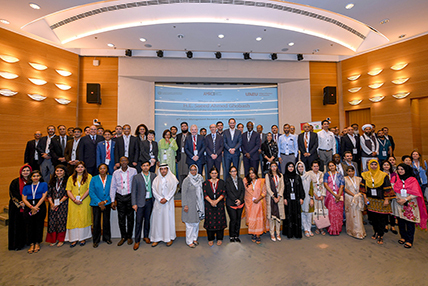 As UAE team leader for the Global Entrepreneurship Monitor (GEM) program - the largest on-going, international research program on entrepreneurship in the world - Professor Chabrak is interested in researching the links between entrepreneurship and wellbeing. With her colleague, Dr. Chafik Bouhaddioui, she has developed a long-term research project using data from the GEM program. The purpose of this research is to examine the potential relationship between entrepreneurship and happiness in the UAE in order to help policy makers evaluate entrepreneurship as a measure of wellbeing and to encourage further growth. 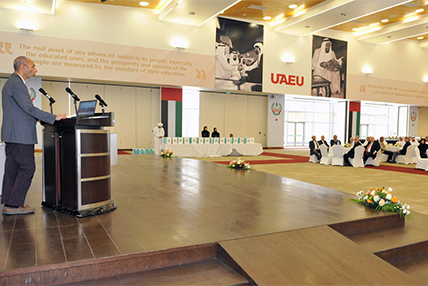 As a Chair of UAEU Committee for Dubai Expo 2020, Professor Chabrak was instrumental in designing the UAEU pavilion. During the Expo the pavilion’s theme will be how to generate 100 million ideas and transform them into 100 million successes. Professor Chabrak teaches Accounting, Corporate Governance, and Corporate Social Responsibility (CSR) as well as a Stanford course on Entrepreneurship and Innovation. She is also involved with a unique leadership course that utilizes both ontological and phenomenological approaches. Before coming to UAEU, Professor Chabrak was living and working in France. She is a joint Tunisian and French citizen. When in France she was an Assistant Professor and then an Associate Professor at the Institut Mines Telecom (2002-2011). Before, that she was a Business and IT consultant. Her studies took her to IHEC Carthage (Tunisia) before attending the University of Paris Dauphine in 1995. She has enjoyed visiting professorships at the University of Wisconsin, USA; University of Canterbury, New Zealand; Deakin University, and the University of South Australia, Australia. She has published articles and served on several editorial boards of international journals. She is the co-founder and organizer of the International CSAF Conference (Tunisia, 2009; the UAE, 2013). Professor Chabrak lives in Al Ain with her cat Candy and looks forward to retiring to a remote island surrounded by dogs and cats. When Dr James Kelley says that he doesn’t sleep very often, he may be joking – but, as his life beyond academia shows, there’s more than an element of truth in it, and he wouldn’t have it any other way. Not only is he a dad to four children aged between two and nine, he is an avid fitness fan who, having grown up playing water polo and swimming while winning a sporting scholarship to college, and is now a triathlon enthusiast. Being married to a triathlon coach helps, of course. And when Dr Kelley is not in the office and absorbed in his research, he can also be found continuing the quest to perfect his golf game. 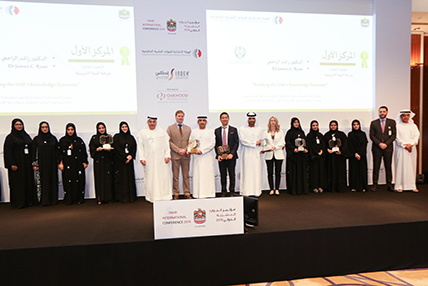 So, considering the active lifestyle he leads, it’s little surprise that his work at UAEU is heavily focused on enhancing health and wellbeing - specifically, in the workplace. 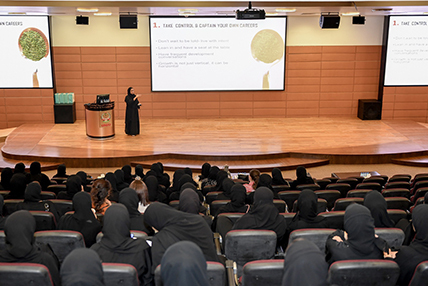 Having worked in four countries, all of which have had – and, in the case of the UAE, are having – an influence on the global and multicultural approach he brings to teaching. Originally from the city of Portland, Oregon, in the US, Dr Kelley taught English in Japan and gained a Masters in Business Research and a Ph.D in International Marketing at the University of Western Australia, before returning to his homeland to take up his first faculty position. Along the way, he produced a series of academic papers that delved into the way consumers interact with global brands, and the role that online brand communities play in engaging the public. But, as Dr Kelley explains, his chief goal for his work was for it to “make a difference, and have a greater impact in academia and on society as a whole”. That inspired his decision, in 2015, to write a personal strategic plan, based on a definitive theme: to help employers create the conditions for a healthy and happy workforce, using marketing and technology. Learning from experts in the field of business represented the first phase of putting this plan into practice, as Dr Kelley launched the ‘Brave Endurance Wellness’ Podcast through iTunes, interviewing 70 leading corporate figures and business executives about their own experiences and journeys, and their thoughts on the issue of health and wellness. The results are intended to form phase two of the plan – a book on the subject – while the podcast, which has a download audience in 35 countries, is continuing under the name ‘Executives After Hours: Real Conversations With Leaders’. “What is great about the podcast is that it’s globally downloaded, whether it’s in the UK, Australia, the US, or France,” he says. Now the third phase of the plan he began working on less than two years ago is in operation. It centers on taking a global approach to research and perspective, with Dr Kelley’s experience of living in different countries galvanizing him to learn about other cultures and gain knowledge and insight from different nations which each face their own particular health and wellness issues. And it was this that led him to UAEU. He has secured a startup grant that is allowing him to explore how technology shapes employees’ workplace behavior, through the use of ‘beacon technology’ – a means of sending a text message to a person when they are about to enter a certain areas, and giving them a ‘healthy behaviour nudge’ – such as encouraging them to use the stairs rather than the elevator, or stop to drink a glass of water and stay properly hydrated. Dr Kelley is also a founding member of the GCC Well-Being Association, the first body of its kind in the region. 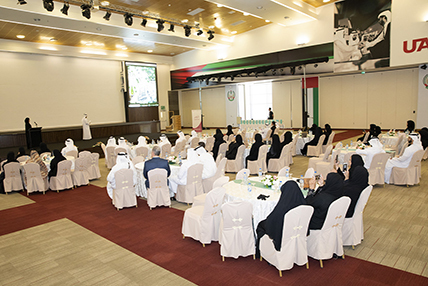 Its mission is to provide senior leaders with a forum that can help them in addressing workplace health and wellness. إنني الآن أنظر إلى الأمور بمنظار مختلف، ليس في مجال العمل فحسب بل في حياتي الشخصية أيضا. لقد تطورت عملية تفكيري وأصبحت أكثر تحليلا للأمور ..
كلية الإدارة والاقتصاد هي بيتنا الكبير ، وهي المكان الذي ننمو فيه ونكتشف الحياة ونتعرف على إمكانياتنا. المكان الذي بدأت رحلتي منه .